Objective: The aim was to compare the surgical success rates of pars plana vitrectomy (PPV) with and without scleral buckling (SB) in the management of inferior break retinal detachments (RDs) associated with proliferative vitreoretinopathy (PVR). Methods: This retrospective analysis included all cases of inferior break RD with PVR (grade B, C) that underwent PPV by the same surgeon, from March 2008 to March 2012. Patients were divided into two groups: Group A for whom scleral buckle was inserted, and group B for whom no scleral buckle was used. Results: A total of 78 eyes with inferior break RD were enrolled in this study. Primary retinal attachment was achieved in 26/36 cases (72.2%) in group A. While it was achieved in 30/42 cases (71.4%) in group B (P = 0.861 - not significant). Primary success rate (retinal attachment) in cases with PVR grade B was 18/21 (85.7%) in group A, and 21/24 (87.5%) in group B. While primary success rate in cases with PVR grade C was 8/15 (53.3%) in group A, and 9/18 (50%) in group B. Conclusion: In the management of inferior breaks RD by PPV with PVR (grade B, C) adjunct use of SB does not alter the reattachment success rate. The objective of this study is to compare the surgical success rates of PPV versus PPV/SB in the management of inferior break RRDs with moderate and severe PVR (grade B and C). This is a retrospective analysis, comparing two procedures to correct inferior break RRD with PVR conducted by the same surgeon at Ibn Al-Haetham teaching eye hospital in Baghdad, during the period from March 2008 to March 2012. This study included all cases of inferior break RRD with PVR (grade B and C) that underwent PPV with silicon oil as the initial surgical intervention. All stages of PVR grade C (focal or diffuse, anterior or posterior) presented during the period of this study were included. Cases with closed funnel-shaped retina and poor projections to light were considered as un-operable and were excluded. Patients were divided into two groups: Group A consisted of patients who were operated on between March 2008 and March 2010, for whom PPV/SB, and group B, which included patients that were operated on between March 2010 and March 2012 for whom no scleral buckle was used with PPV. Inferior retinal break (s) were classified according to their location below the 4 and 8 O'clock meridians. Cases with fresh retinal detachment (RD) with PVR grade A, penetrating ocular trauma, and eyes that had been operated previously for RRD were excluded from the trial to avoid any undesirable outcome. Preoperative assessment included: Visual acuity (VA), slit-lamp examination of the anterior segment, both slit-lamp bio-microscopy and indirect ophthalmoscopy of the vitreous and retina of both eyes. A written consent was obtained from each patient before surgery and after explaining to them the type of surgical interference and the possible complications. Ethical board approval was granted by the Scientific Committee of Ibn Al-Haetham eye hospital. Patients in Group A underwent primary SB with 2.5 mm silicon band inserted circumferentially under the four recti muscles, sutured with the sclera at the equator. All patients underwent a standard three port 20-gauge PPV. Using a wide field viewing system (Oculus BIOM); complete vitrectomy with 360° scleral indentation was carried out. Posterior vitreous detachment (PVD) was induced in cases with still attached posterior hyaloid membrane by use of high suction over the optic disc. PVD was confirmed by observation of the Weiss ring in front of the retina. Cases with PVR grade C were managed by membranes peeling and/or relaxing retinectomy (s) in order to flatten contracted retina. Retinectomy (s) performed at sites of PVR, frequently by extending the primary inferior breaks, and sometimes in cases with advanced PVR, retinectomy(s) exceeded 180°. Perfluorocarbon liquid (PFCL) was routinely used as an intra-operative internal tamponade agent to flatten the retina. The vitreous cavity filled gradually with PFCL with internal drainage of sub-retinal fluids from sites of retinectomies. Internal laser retinopexy was performed surrounding retinectomies and any additional break(s). Cataract extraction was only performed if lens opacity was impairing the view during the surgery. All patients underwent direct heavy liquid/silicone oil exchange, or heavy liquid/air exchanged followed by air/silicon exchange. Silicone oil (1300 centistrokes [Adato, Bausch and Lomb, UK]) was used for exchange with PFCL. Postoperatively; all patients included in this study were given instructions to maintain a good face down head posture for 1-week. Patients were followed-up at regular intervals, and the follow-up data (including postoperative VA, retinal status, and any related complications) were recorded in special cards. Silicon was removed in flat retina cases after 3-4 months from date of operation. Main outcome measure was surgical success rate (retinal attachment 1-month following silicon removal). IBM SPSS program version- 19 was used to treat and analyzed data. Chi-squared test of significance was used to test for association between variables, with P ≤ 0.05 was used as cut-off point of significance. A total of 78 eyes with inferior break RD were enrolled in this study. The patients age ranged between 8 and 70 years (mean age was 50.2), male to female ratio was 1.5:1, and left to right eye ratio was 1.4:1. Thirty-six patients were included in group A (PPV/SB) and 42 patients in group B (PPV). Mean age in group A was 51.4 years, whereas mean age in group B was 49.7 years. Preoperative VA in both groups ranged between light projections and 6/60. All included cases had macula off. The preoperative characteristics of the patients showed no significant difference between the two groups indicating a homogenous sample with relative matching regarding these characteristics as shown in [Table 1]. In group A; 21 cases had PVR grade B and 15 cases had PVR grade C, while in group B; 24 cases had PVR grade B and 18 cases had PVR grade C.
Of 78 cases included in the study, primary retinal attachment was achieved in 56 cases (71.8%). 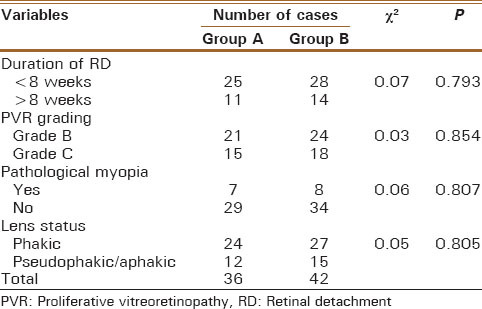 In group A; primary retinal attachment was achieved in 26 out of 36 cases (72.2%) While in group B; it was achieved in 30 out of 42 (71.4%) (P = 0.861 - not significant), [Table 2]. 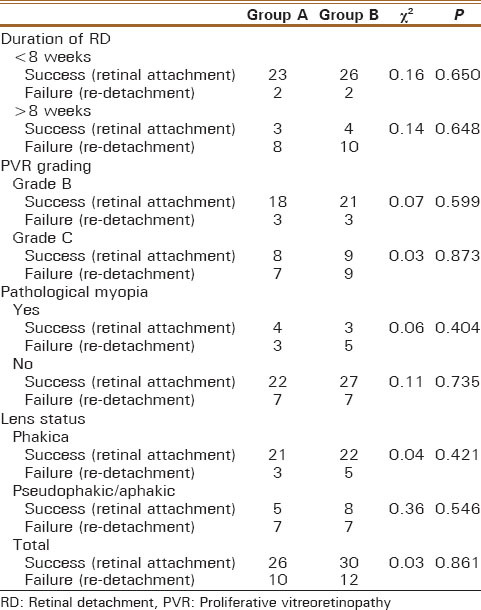 The statistical analysis of the results showed no significant association between the outcome of both surgical operations in respect to: Duration of RD, PVR grading, presence of pathological myopia, and lens status (phakic, and pseudophakic/aphakic) [Table 3]. Primary success rate (retinal attachment) in cases with PVR grade B was 18/21 (85.7%) in group A, and 21/24 (87.5%) in group B. Although primary success rate in cases with PVR grade C was 8/15 (53.3%) in group A, and 9/18 (50%) in group B.
Retinal attachment was achieved after the second operation in 4 patients in group A and in 6 patients in group B. The final attachment rate was 83.3% in group A and 85.7% in group B (P =0.980 - not significant). In group A, 29 eyes had improvement of vision, one eye with the same VA as that preoperatively, and 6 eyes with worse vision. In group B, 33 eyes had improvement of vision, two eyes with the same VA as that preoperatively and 7 eyes got worse vision. The role of SB in PPV for the management of inferior break RRD is still a controversial step. Alexander et al. compared the results in their study with previously published data from groups who have not performed supplementary buckling, and concluded that SB improves and enhances primary success rates in inferior break detachments over vitrectomy and gas without buckling. Other studies had concluded that PPV and PPV/SB seem to have similar efficacy in the management of primary inferior break RRD and the addition of SB does not improve the results. [5, 12, 13] These studies were conducted on cases with mild to moderate PVR (grade B or less) and expanding gas was used as an internal tamponade agent in most of the cases. In the current study, all patients included had inferior break RD with significant PVR (grade B or C), and silicone oil was used as a tamponade agent. Silicone oil (polydimethylsiloxane) has the advantage of being a long lasting tamponade agent is widely used in PPV for RDs with advanced PVR. [14,15] Silicone oil with a specific gravity of 0.97 float over water and silicone bubble is round with little buoyancy to modify its shape. Theoretically; silicone cannot be expected to achieve closure of retinal breaks circumferentially and simultaneously, owing to the difficulty in filling the vitreous cavity completely. The overall tamponade efficiency is decreased because part of the volume is used to form the meniscus instead of making contact with the retina. Application of the encircling band alters the shape of the vitreous cavity, and in a module eye the presence of indentations may enhance the tamponade efficiency of silicone inferiorly. In the current study, patients with advanced PVR were managed with large inferior relaxing retinectomy(s), which may effectively address proliferation,  and relieve of vitreous traction at the base of the vitreous. Large inferior relaxing retinectomy(s) may enable silicone bubble to exert a tamponade effect at the margins of the retinectomy(s) that exceed the lower meniscus between the bubble and vitreous cavity and negates the need for indentations exerted by scleral buckle. All patients included in the current study were instructed to maintain face down posture for 1-week post-operatively to enable silicon oil bubble to act as a tamponade agent on the inferior part of the retina. After repositioning of a detached retina the minimum time required to seal the retinal breaks and development of the adhesions between the RPE and sensory retina is still undetermined. Martínez-Castillo et al. reported that in pseudophakic eyes with inferior breaks RD and without advance PVR; the time required for tamponade agents to close the retinal breaks is within the early hours after surgery, and facedown posture is not necessary. The time necessary for the tamponade agent to close the breaks probably varies with the condition of the retina and the duration of detachment, as in long-standing RD more time may be required to resume the normal physiological attachment between the RPE and sensory retina, and for effective occlusion of retinal break(s). Several previous studies concluded that the addition of an SB with PPV for primary RRD is not warranted. [5, 12, 13, 21, 22] All these studies conducted on noncomplex cases of RDs, and patients with PVR grade C or worse were excluded from these studies. To the best of our knowledge probably this is the first study compares the anatomic success rate between the two the surgical techniques of PPV and PPV/SB for cases of RRD and included patients with advanced PVR. More studies are required about this subject, including more number of eyes with different stages of advanced PVR. In the management of inferior breaks RRD with significant PVR (grade B, C) by PPV, adjunct use of SB does not alter the reattachment success rate. Leaver P. Expanding the role of vitrectomy in retinal reattachment surgery. Br J Ophthalmol 1993;77:197. Ah-Fat FG, Sharma MC, Majid MA, McGalliard JN, Wong D. Trends in vitreoretinal surgery at a tertiary referral centre: 1987 to 1996. Br J Ophthalmol 1999;83:396-8. Barrie T, Kreissig I, Heimann H, Holz ER, Mieler WF. Repair of a primary rhegmatogenous retinal detachment. Br J Ophthalmol 2003;87:782-4. Wickham L, Connor M, Aylward GW. Vitrectomy and gas for inferior break retinal detachments: Are the results comparable to vitrectomy, gas, and scleral buckle? Br J Ophthalmol 2004;88:1376-9. Fawcett IM, Williams RL, Wong D. Contact angles of substances used for internal tamponade in retinal detachment surgery. Graefes Arch Clin Exp Ophthalmol 1994;232:438-44. Yoshida A, Feke GT, Green GJ, Goger DG, Matsuhashi M, Jalkh AE, et al. Retinal circulatory changes after scleral buckling procedures. Am J Ophthalmol 1983;95:182-8. Ryan SJ, Goldberg MF. Anterior segment ischemia following scleral buckling in sickle cell hemoglobinopathy. Am J Ophthalmol 1971;72:35-50. Rubin ML. The induction of refractive errors by retinal detachment surgery. Trans Am Ophthalmol Soc 1975;73:452-90. Hayashi H, Hayashi K, Nakao F, Hayashi F. Corneal shape changes after scleral buckling surgery. Ophthalmology 1997;104:831-7. Alexander P, Ang A, Poulson A, Snead MP. Scleral buckling combined with vitrectomy for the management of rhegmatogenous retinal detachment associated with inferior retinal breaks. Eye (Lond) 2008;22:200-3. Tanner V, Minihan M, Williamson TH. Management of inferior retinal breaks during pars plana vitrectomy for retinal detachment. Br J Ophthalmol 2001;85:480-2. Sharma A, Grigoropoulos V, Williamson TH. Management of primary rhegmatogenous retinal detachment with inferior breaks. Br J Ophthalmol 2004;88:1372-5. Laidlaw DA, Karia N, Bunce C, Aylward GW, Gregor ZJ. Is prophylactic 360-degree laser retinopexy protective? Risk factors for retinal redetachment after removal of silicone oil. Ophthalmology 2002;109:153-8. Herbert EN, Williamson TH. Combined removal of silicone oil plus internal search (ROSO-plus) following retinal detachment surgery. Eye (Lond) 2007;21:925-9. Wetterqvist C, Wong D, Williams R, Stappler T, Herbert E, Freeburn S. Tamponade efficiency of perfluorohexyloctane and silicone oil solutions in a model eye chamber. Br J Ophthalmol 2004;88:692-6. Wong D, Lois N. Perfluorocarbons and semifluorinated alkanes. Semin Ophthalmol 2000;15:25-35. Williams R, Wong D. The influence of explants on the physical efficiency of tamponade agents. Graefes Arch Clin Exp Ophthalmol 1999;237:870-4. Tsui I, Schubert HD. Retinotomy and silicone oil for detachments complicated by anterior inferior proliferative vitreoretinopathy. Br J Ophthalmol 2009;93:1228-33. Martínez-Castillo V, Boixadera A, Verdugo A, García-Arumí J. Pars plana vitrectomy alone for the management of inferior breaks in pseudophakic retinal detachment without facedown position. Ophthalmology 2005;112:1222-6. Kinori M, Moisseiev E, Shoshany N, Fabian ID, Skaat A, Barak A, et al. Comparison of pars plana vitrectomy with and without scleral buckle for the repair of primary rhegmatogenous retinal detachment. Am J Ophthalmol 2011;152:291-7.e2. Weichel ED, Martidis A, Fineman MS, McNamara JA, Park CH, Vander JF, et al. Pars plana vitrectomy versus combined pars plana vitrectomy-scleral buckle for primary repair of pseudophakic retinal detachment. Ophthalmology 2006;113:2033-40.